Juma Kimweri and Jody Adams prepare a meal in Tanzania. 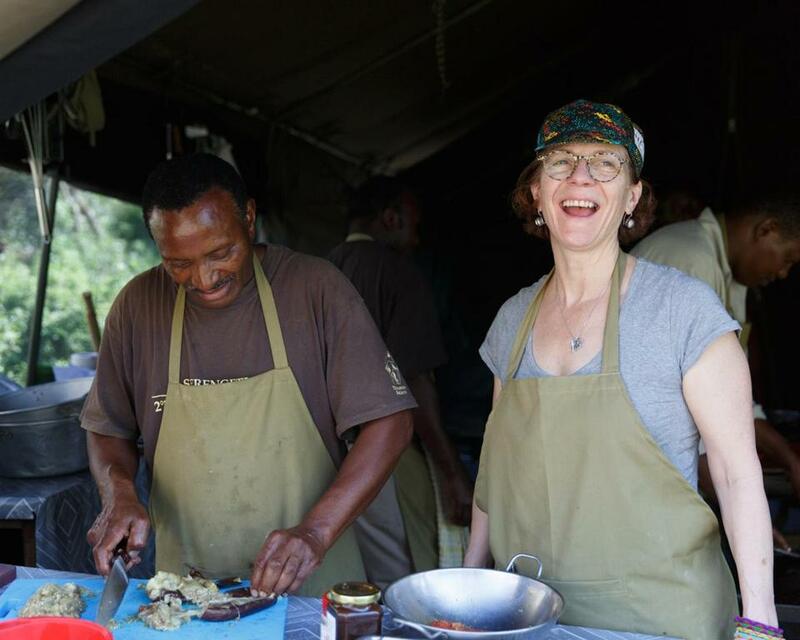 In February, Watertown-based Thomson Safaris organized “A Taste of the Wild with Chef Jody Adams,” a 12-day trip to Tanzania that included a big-game safari and other natural and cultural stops. Brookline resident Adams, 59, is the James Beard Award-winning chef behind Harvard Square’s Rialto (which she recently announced she will be leaving in June), and Trade, in Boston’s Seaport District. Her most recent venture is Saloniki, a quick-casual Greek restaurant that opened in Fenway earlier this year. Below are edited excerpts from an interview with Adams about the trip, which repeats next year, Jan. 21-Feb. 1 (from $8,990 per person). Q What inspired you to go on safari? A I’ve known Rick (Thomson) and Judi (Wineland) of Thomson Safaris for years. They know I’ve led bike trips for people interested in cycling and food, mostly in Italy. For a few years they’ve been saying “you should bring your group to Africa,” but I hadn’t really thought about a culinary safari. But once we starting talking about the quality of food and the fresh ingredients, I was sold. A lot of the ingredients were very familiar, like eggplants, garlic, tomatoes, goat, and chicken. Q What was the general itinerary and what was expected of you? A We were at the Eastern Serengeti Nature Refuge, Serengeti National Park, and Ngorongoro Highlands and Crater. I cooked a few times with camp chefs and led a day-long session at Gibb’s Farm, an amazing eco-lodge. That’s the only place I had a full kitchen. Q Most of your tours have been in Western Europe. Were you worried about the culinary challenges in a less-developed country? A I’d been in Africa a few times, but of course there were a lot of unknowns. I’m coming into someone else’s kitchen in a foreign environment and I don’t know how they do things. I knew that the safari camps weren’t terribly rustic, though there is no electricity and no running water and you cook with charcoal or propane. Plus they have to truck everything into the middle of the Serengeti. So I had a little nervousness, but mostly excitement. My life is really organized, so to be thrown into a situation where I have to think on my feet, I love that. I have a dream of having a TV show where I’d be dropped from a plane wearing a fanny pack with olive oil, salt and pepper, and few other essentials, with no idea where I was going, and come up with a meal. Q Were you concerned about cultural or language barriers? A I like environments that are interesting and challenging and where I learn about people, how alike we are and how different we are. In a kitchen there’s an understanding that doesn’t require verbal language. The language is through your hands and your ingredients. It’s really fabulous. Q What did you pack for cooking? A I brought tongs, a microplane, a peeler, and five different knives that I could bear to lose, just in case. Q Your husband, Ken Rivard, is a photographer. Was he excited to join you? A It was kind of a dream come true for him. He brought one of those ginormous lenses that it takes three people to hold. Q What was your setup like in the Serengeti? A Our guide, Willie (Hombo), was a wealth of knowledge. He exuded so much pride in Tanzania. There were 15 of us – all from New England. We first stayed at the Arusha coffee lodge, which was beautiful, then flew into the Serengeti. At the safari camps, we had some generators for refrigeration, and solar-powered lights in tents. Heated water is available, but not running water. When I first heard we weren’t allowed to walk around at night because of wild animals, I thought it would be claustrophobic, but by the end of the day, we were so tired and ready for a glass of wine and a great meal that it didn’t matter. Q What did you cook with the safari chefs? A They call little dishes “bitings.” Don’t you love that? Coconut is used a lot in Tanzania, not just as a flavoring but as a fat. For a biting, I toasted coconut, let it harden, and fried it into little crisps. The cooks make a spinach puree, so I made one with ginger and also a charred eggplant puree. I used their flavorings, but brought an Italian technique. We ended up grilling a lot of veggies to serve with eggplant, basically baba ganoush. We shared and exchanged ideas using similar recipes but different techniques. Q What were some of the safari highlights? A The big one for me was watching a cheetah eyeball a gazelle from way across the way and our guide knowing what would happen. In a second, that cheetah was there. The other gazelles just froze, watching this happen, like a ritual of acceptance and then they turned away and left as the cheetah sat down to eat. Also, we were there during the migration of the wildebeest and zebras, and we saw thousands and thousands of them together. The guides take enormous pride in making sure the guests see the best of things. They were determined we’d see the big five, and we did. Also, in the Ngorongoro Crater, the flamingoes just blanketed the horizon. We also had the chance to spend some time with the Maasai community. It was a real privilege to talk to them. Q What did your cooking day at Gibb’s Farm involve? A Some guests milked cows, some baked bread, others picked veggies, and then we all worked in the kitchen and made a beautiful meal. We had spatchcocked chicken, fresh pasta with pesto, roasted beets, asparagus with lemon zest. Dessert was a passion fruit souffle that didn’t work. It rose and fell quickly. Everybody thought it was delicious, but it definitely wasn’t a souffle.